Daily Update: I have new toys! I hit my 225,000 word goal ahead of schedule. Not just ahead of schedule, but a whole month ahead of schedule. I’m super excited about that. Of Gnomes and Dwarves is coming along so nicely. I’m very happy with not only how fast I’m getting it written, but how well I feel I’m writing it. I’m sure I’ve got errors and mistakes, and probably a continuity error or two, but using Scrivener I know it’ll be easy editing. If I need to move something around, it’ll be a piece of cake. So having hit my goal yesterday, I allowed myself to open up the package that arrived and dig into its contents. When I say it took all my willpower not to open them, I’m not kidding. I wasn’t even going to open the amazon box until I had hit my word count. I couldn’t hold back and I had to tear into the box just to see them. I left them sitting there, taunting me, challenging me to hit my word count. To compound my frustration I had to work, go to my favorite daughter’s volleyball practice after school, do some house work, take my favorite daughter to her regularly scheduled volleyball practice, book a hotel for tonight (she has her last away game this weekend) and still get my writing done. I hit my word goal, plugged in the devices, and I’ve been happy ever since. OMFG! How did I live without these before? I spent an hour this morning programming the mouse buttons. Now all the tasks that I normally do with multiple keystrokes of key combinations I can do with a movement of my thumb or a click of a button. I made a macro that opens up all the applications that I need open at the start of the day. One click. I have a button that will auto fill forms for me with specific information. Programming either of these is a breeze! The only complaint I have so far is once I set up a macro, I cannot add something in the middle or reorder the items in the list. I must delete and rerecord. But hey, that’s a minor thing. So you’ve looked at the picture, here’s what I got as my half-way goal prizes! 3) The Steelseries 4D mouse surface. I could not be happier at this point with my purchases. I’ve only scratched the surface with what these tools can do for me. I know as time goes on I’ll be doing more and more with them. I just need to give me hands time to adjust to them. But seriously, I could NOT be happier with my purchases. That was the main reason for getting them. To give me a moment of happiness. Heck, this moment will last a LONG time. I bought these to use mainly with work. Obviously when I’m writing, I’m doing just that; writing. I don’t need anything else other than the keyboard and (now) Scrivener. I don’t know how I got by with Scrivener before either. But when it comes to work, I’m a programmer. I use my mouse all day every day. I wanted something that did more than just point and click and I found that mouse. This one is larger than I’m used to, but I’m quickly adapting. The gamepad, on the other hand (literally) is currently being used for multi-key commands that I used infrequently. I’m sure as I get used to having it, I’ll discover more and more that I can do with it. I can attach ‘run’ command and execute .BAT files to execute really complex commands, open programs, launch web pages, heck, basically anything I need to do. I’ll keep you posted as to how I set these up. Am I excited about my new toys? You betcha. Will I get full use out of them? Time will tell but I’m guessing not because I’m not a gamer. At some point in my life I might pick up gaming again and I’ll be happy I have these devices. Welcome to June! I hope you have an awesome day. Some ducks flapped by my window this morning, but I didn’t get a picture of them. Perhaps tomorrow! Posted on June 1, 2012, in Blog Post, Daily Update and tagged gaming devices, gaming mouse, M.M.O. 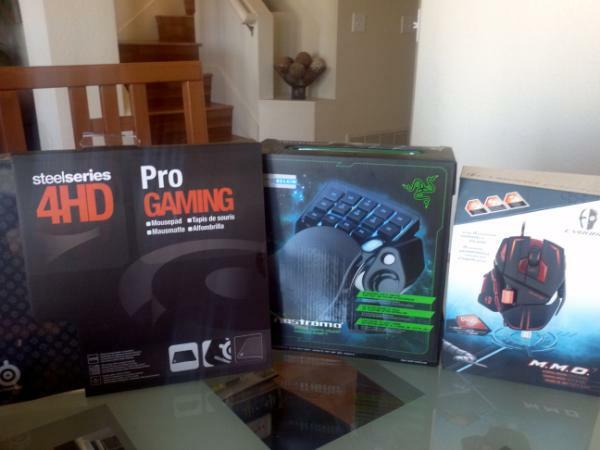 7 gaming mouse, new toys, razer nostromo, steelseries 4D. Bookmark the permalink. 1 Comment. Wow, those things look amazing! Especially love the mouse!